“It’s nice to see our country stepping up and displaying our generosity … my concern, though, is that it was perhaps a little bit misleading," advocate says in response to Trudeau's tweet welcoming refugees. 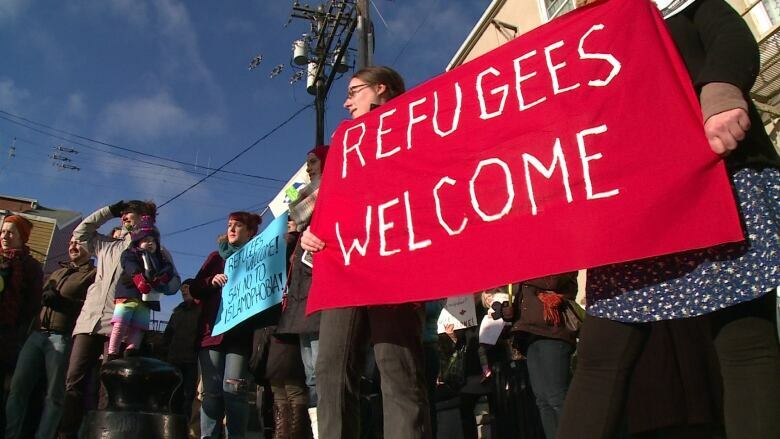 Legal advocacy groups call for review of Canada's Safe Third Country Agreement with U.S.
A North Vancouver advocate has a message for Prime Minister Justin Trudeau: actions speak louder than tweets. Trudeau received mostly positive attention for a Saturday tweet where he took a very different tone than U.S. President Donald Trump on the issue of refugees. After Trump issued an executive order restricting refugees and travellers from seven Muslim-majority nations, Trudeau tweeted them a welcome. But Laurie Cooper, founder of Canada Caring, says the Canadian government isn't helping refugees by removing the cap on privately sponsored refugee applications. "It's nice to see our country stepping up and displaying our generosity … my concern, though, is that it was perhaps a little bit misleading, unless there is a plan to increase the quota of refugees for this year," she told On The Coast host Stephen Quinn. Cooper is concerned that privately sponsored refugee applications are capped at 1,000 for 2017, a number she says has already been reached. "So as of now, there are no more private sponsorships that are able to be submitted." Immigration, Refugees and Citizenship Canada has said the cap is in place to address a backlog of applications, but Cooper says a better way of solving the problem would be to devote more resources to processing them. Cooper says she knows of "several" community groups that were ready to accept refugee families, but whose application didn't fit under the cap. "These are people who've spent months raising the money and finding accommodations, sometimes they've lined up jobs," she said. "Their applications are not even going to be reviewed." Other advocacy groups have called for action from the federal government since Trump's executive order. The Canadian Association of Refugee Lawyers said Canada should revisit its Safe Third Country Agreement with the United States. The B.C. Civil Liberties Association called on the government to suspend the agreement. On The Coast requested a response from the Ministry of Immigration, Refugees, and Citizenship for this story but did not hear back.